Searching for a good spot to kite the dunes. 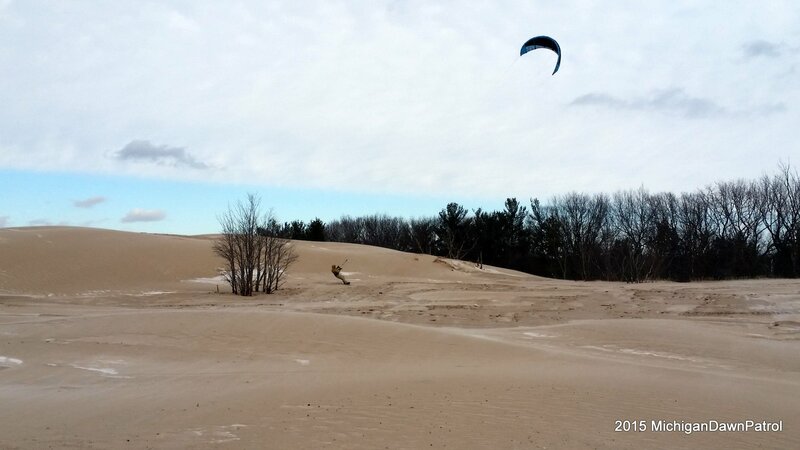 Against better judgement(and advice) we went to Silver Lake yesterday in hopes of snow kiting the sand dunes. We didn’t make it to Silver Lake last winter and with all the recent snowstorms we figured it was worth a try. The roads were a little icy this morning as we headed north on US 31. The forecast was for West winds in the 20 knot range near the lakeshore and in Muskegon it was already blowing in the mid 20s. We exited off the highway at Shelby road and stopped at the gas station. Silver Lake is a ghost town this time of year so we had to grab a few snacks for what we hoped would be a long day of kiting. We hopped back in the car and headed west for the last leg of the trip to the dunes. As we rounded the corner and the dunes came into view we were disappointed to see that they were their normal golden tan color instead of pure white as we had imagined. 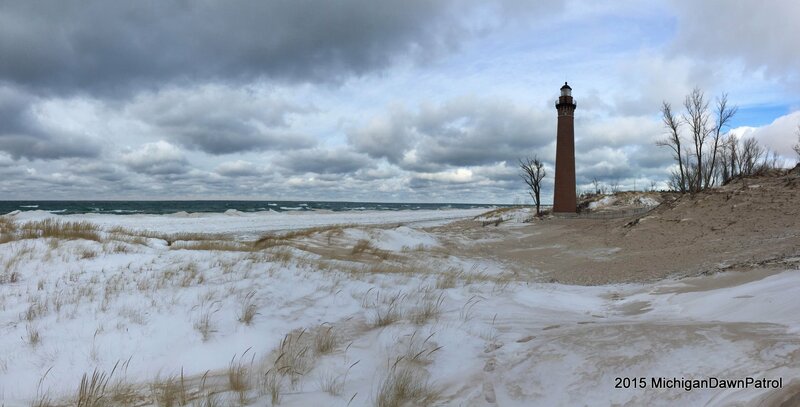 We decided to check out the beach near Little Sable Point first in hopes that there was more snow near Lake Michigan. The wind was bitter cold at the lakeshore and although there was more snow there was a ton of ice and there was no way we were going to try snowkiting there. Silver Lake came back into view as we drove North towards the state park entrance. 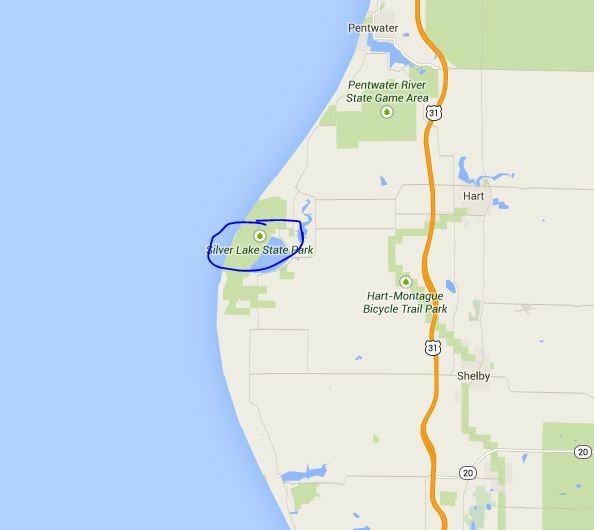 The lake was frozen solid with good snow cover towards the East and Northeast sides. We came to the park to try to ride the sand dunes, not the lake, so we kept on going. We parked near the stairs to the dunes and began the hike up the hill. The snow mixed with sand made the hills steeper and harder to climb than usual(I’m sure the extra weight I was carrying from the holidays and lack of exercise also contributed to the difficulty of the climb!). 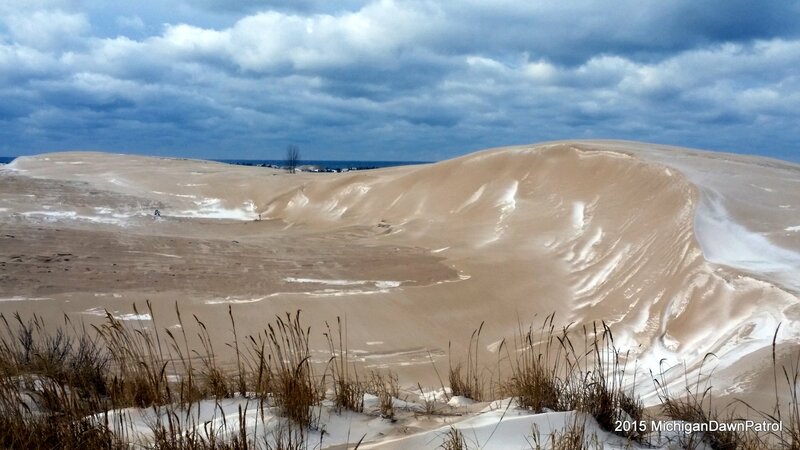 Once at the top of the dunes we were rewarded with spectacular views of Lake Michigan, Silver Lake, and the sand dunes. We scouted the area for a good place to setup our gear. 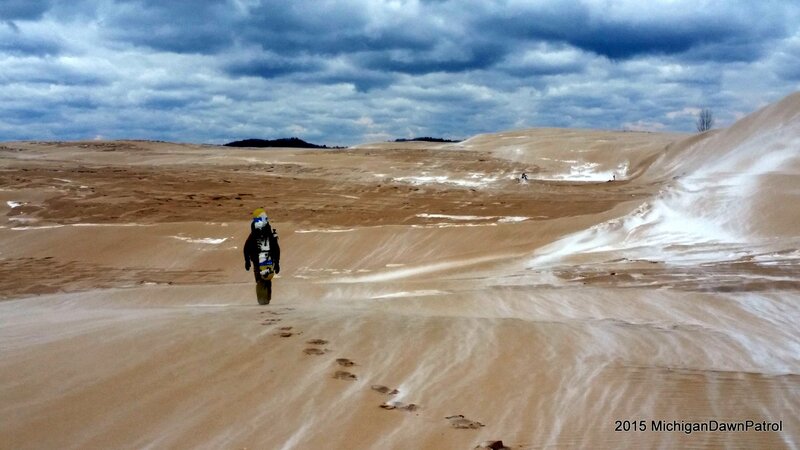 The dunes were a mixture of sand and snow. In some areas there was light dusting of sand on top of deep snow but in other areas it was mostly sand with a little ice. 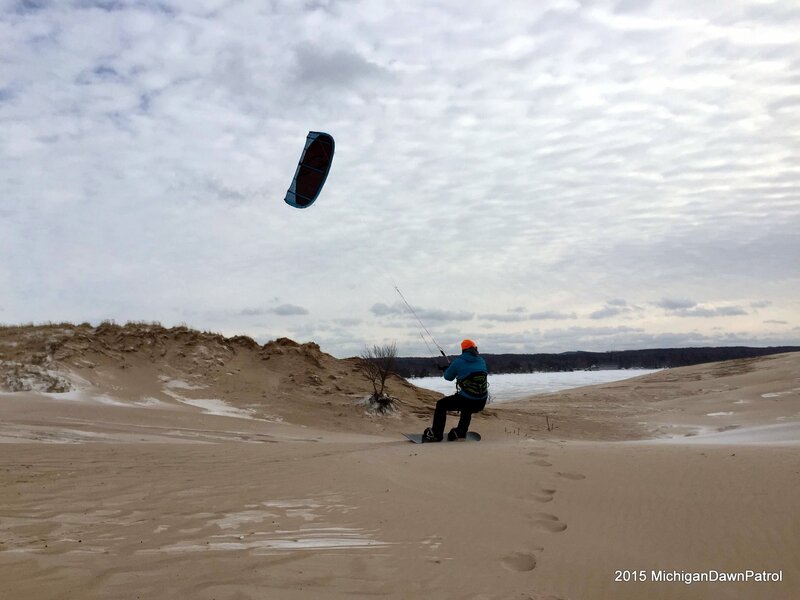 Not ideal conditions to snow kite but looked doable so we got our kites out and geared up. Jetty took the first ride on the 5.5 meter. He was working the kite pretty good and not going very far. It was really windy on top of the dunes but we concluded he needed more kite to glide across the sandy mixture so we pumped the 8 meter. I took the first turn on the 8 meter. The extra friction from the sand was immediately noticeable. It took a lot of effort to get going and I had to keep my speed up otherwise I’d quickly come to a stop. I took a few tacks and made it up the hill closest to where we had setup. I wasn’t able to stay upwind so I unstrapped my board and made my way back to where we launched. Jetty took his turn next and was had an easier time staying upwind and zipping up the hills. After he was done I took one more turn before we packed up. Snowkiting on the sand wasn’t easy but it was a fun experience and we are ready to return later in the season when there is a good base of snow. I must have been there a couple days before when there was still some snow covering the south faces of the dunes. Once the wind blows, sand covers any remnants of white pretty quick. If you are looking at it again, either the NOAA snow depth charts are off for this week (March 5-6) , or there is a good 12-20″ base covering the area. Vlad, Thanks for the heads up about the snow base. This Saturday could be my last chance to get up there before the snow melts. Last time I went it seemed like most of the snow had blown off or was buried in sand. The lake didn’t have any snow either. Have you rode there when there’s been good snow coverage and how was it?